Disability from an accident or illness can strike anyone at any age. If you’re under age 35, you have a one in three chance of becoming disabled for six months or more at some time during your working life. The City of Woodstock provides all eligible employees the option of disability coverage through OneAmerica. Voluntary Short Term Disability (STD) replaces 60% of your weekly income up to a maximum of $2,000 per week if a non-occupational injury or illness forces you out of work for an extended period of time. Benefits begin on the 15th day after an accident or illness. Benefits may be payable for up to 11 weeks. Any short term disability benefit payable to you may be offset by other types of income. Pre-existing condition limitations may apply. If coverage is elected, the premiums are paid for 100% by you. Long Term Disability (LTD) replaces part of your income if you are disabled more than 90 days. Long term disability replaces 60% of your monthly earnings up to a maximum of $5,000. Partial disability and rehabilitation are also covered. Any long term disability benefit payable to you may be offset by other types of income. Pre-existing condition limitations may apply. This plan is 100% paid for by the City of Woodstock. Call the OneAmerica disability claims team at (855) 517-6365 to reach a representative that can walk you through the process. 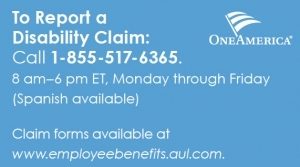 Download the disability claims form at www.employeebenefits.aul.com and return the completed form to OneAmerica via one of the options below. • Tax Liability – Any compensation received as STD or LTD may be considered taxable income. • Portability – STD and LTD are not portable benefits. • Offset Income – Sick leave payable by the employer or other income may be deducted from the benefit amount.